ALL TOO HARD (AUS) (Bay 2009-Stud 2013). 7 wins-3 at 2, ATC All Aged S., Gr.1. Half-brother to SW Black Caviar. 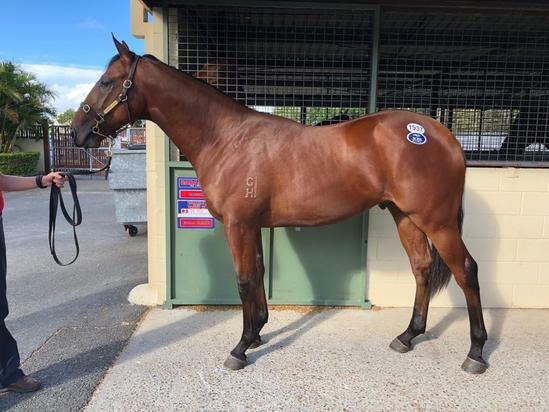 Sire of 175 rnrs, 88 wnrs, inc. SW Villermont (MRC Sandown Guineas, Gr.2), Demonetization, Unfair Dismissal, All Too Huiying, Curdled, SP Cristal Eyes, Outrageous, Hardly Surprising, Roy's Riviera, Eclair Sunshine, Fine Scent, Waimea Bay, Warranty, Za Zi Ba, Illuminaire, Mystic Empire and of Riviera, Rock Hard, The Mighty Fed, Tarka, etc. Cinomenm (f. by Congrats). Placed at 2 in 2017-18 in Aust. Cramming. 6 wins from 1350m to 2200m, A$207,890, BRC Sky Thoroughbred Central H., SCTC Wimmers Soft Drinks H., 2d BRC Coke H., GCTC Waxy's Irish Pub H., SCTC Tooheys Extra Dry H., 3d Qld Tatt's RC Sapphire Recruitment H., ATC Girvan Waugh H.
Pass the Test. 3 wins to 1200m in Aust. INTO THE NIGHT (Rhythm). 9 wins to 1200m, A$804,200, QTC Cup, Gr.2, STC Starlight S., L, VRC Century S., L-twice, AJC National Telecoms Group H., Country Cash Championship Final H., 2d VRC Salinger S., Gr.1, STC Premiere S., Gr.2, Missile S., Gr.3, Star Kingdom S., Gr.3, Concorde S., Gr.3, 3d QTC Stradbroke H., Gr.1, 4th VRC Newmarket H., Gr.1, NSW Tatt's RC Tramway H., Gr.3. Britomart. 8 wins from 1400m to 2500m, A$321,114, MRC Siren Song H., MVRC Ready Workforce Christopher Stear H., FCM Travel H., Quest Moonee Valley H., MRC Analight H., Chlorophyll H., VRC Lord Mayor's Charitable Fund P., 2d MVRC Fulton Hogan Pty Ltd Mayoral Charity H., MRC Biscadale H., MVRC Advanced Mailing Solutions H., 1 Step Communications H., 3d MVRC St Joseph's College Farewell H., VRC Tellimed H., Ararat Gold Cup. Lucky Shamrock - Lim's Archer (Sing.) (Authorized). 4 wins from 1200m to 1700m to 2017, Singapore TC Super Easy S., Manulife Cup, Lantau Island S., Class 4 H., 2d ATC TAB Rewards 2YO H., Singapore TC Initiation P., Class 4 H., 3d Singapore TC Colonial Chief S., L, ATC Bledisloe Cup Festival 2YO P.
JETBALL (Marscay). Joint top of The 1993-94 Australasian 3YO Classification (1000m - 1400m). 7 wins-3 at 2-to 1200m, A$466,608, AJC Galaxy H., Gr.1, STC Pago Pago S., Gr.2, NSW Tatt's RC Roman Consul S., Gr.3, STC Star Kingdom S., Gr.3, AJC Canonbury S., L, STC Macro Go Welter H., Pacific Rim Race Day 2YO H., 2d Gosford Slipper, L, AJC Brian Crowley S., L, STC AWA Club Keno Quality H., 3d AJC Up & Coming S., Gr.3, STC Heritage S., L, Eskimo Prince H., L, AJC Tooheys Blue Label H. Sire. MARWINA (Marscay). 5 wins-2 at 2-to 1400m, A$389,760, AJC Stan Fox S., Gr.3, NSW Tatt's RC Roman Consul S., Gr.3, 2d VATC Caulfield Guineas, Gr.1, 3d AJC Hobartville S., Gr.2, STC Silver Slipper S., Gr.2, Skyline S., Gr.3. Sire. Prince of Marscay (Marscay). 16 wins-4 at 2-from 1000m to 1650m, A$272,750, QTC CA Morris H., 2d QTC Sir Joshua Bell H., L, 3d BATC Courier-Mail Classic S., L.
RUSSIAN CONQUEST (St. Petersburg). 4 wins-3 at 2-to 1400m, ARC Great Northern Foal S., L, Hawkes Bay Curraghmore Stud 3YO H.
New Maize - Whinscay (Mal.) (Maizcay). 3 wins at 1100m, 1200m in Malaysia, Singapore TC Class 4 H., 2d SAJC Queen Adelaide S., L, Fulham Park P., L.